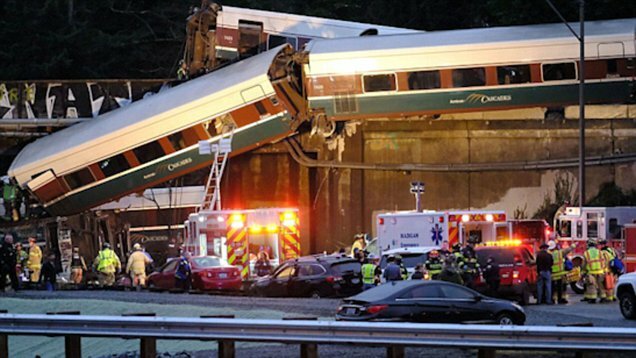 An Amtrak passenger train derailed this morning on its inaugural trip on a new service route near Dupont, Washington killing several people and causing injuries to an even greater number. The train was going south to Portland, Oregon when it derailed while crossing a bridge over Interstate 5 near DuPont, Washington around 7:40 a.m on Monday and spilled some of its cars onto the highway below, killing at least six people, authorities said. The death toll is expected to rise. Seventy-eight passengers and five crew members were aboard when the train moving at more than 80 mph derailed about 40 miles south of Seattle on a route that had raised safety concerns. 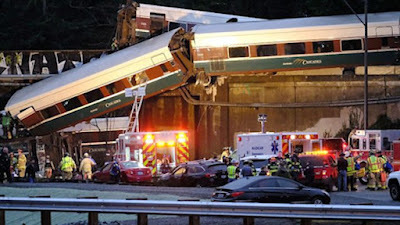 The deaths "are all contained to the train," said Ed Troyer, the Pierce County Sheriff's Office spokesman. "It's pretty horrific." Troyer said several vehicles on Interstate 5 were struck by falling train cars and multiple motorists were injured, but none killed. Police have not given an official death count, but the Seattle Times says it's at least six. Seventy seven were hospitalized. An official briefed on the investigation told The Associated Press that preliminary signs indicate that Train 501 may have struck something before going off the track. The official was not authorized to discuss the investigation publicly and spoke on the condition of anonymity. Family of victims were asked to report to the DuPont City Hall to be reunited with their loved ones. They were told not to come to the scene.